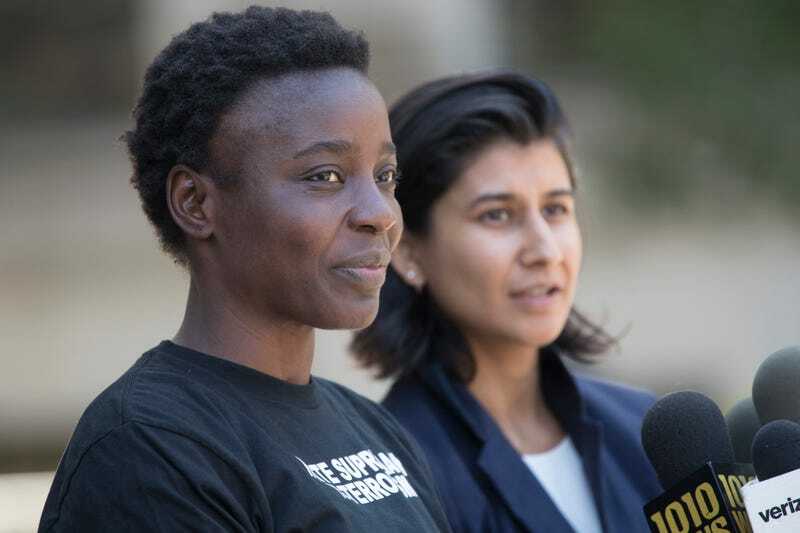 Patricia Okoumou and her attorney Rhiya Trivedi as she speaks to reporters outside Federal court, Thursday, July 5, 2018, in New York. Okoumou pleaded not guilty to misdemeanor trespassing and disorderly conduct for climbing the base of the Statue of Liberty on a busy Fourth of July to protest U.S. immigration policy. A federal judge ruled Patricia Okoumou, known around the world as the “Statue of Liberty Climber,” will not spend any time in jail for her bold July 4 protest. Okoumou climbed the Statue of Liberty last year to draw attention to inhumane U.S. immigration policies. At the time, the Department of Homeland Security’s practice of separating families at the border and detaining children in their own camps was drawing international condemnation. An immigrant herself, Okoumou faced up to 18 months in prison for her demonstration on charges of trespassing, interference with agency functions, and disorderly conduct. She was found guilty on all three counts in December. As A.M. New York reports, during a hearing on Tuesday morning, U.S. Magistrate Gabriel Gorenstein ordered the 46-year-old protester to serve 200 hours of community service. Okoumou was also placed on probation for five years, with a warning from Judge Gorenstein that she would be jailed if she breaks the law during any more protests. That last caveat could mean that Okoumou could still face prison time in the near future: as she has told multiple outlets, she has no plans on taking a break from her immigration activism. While the Statue of Liberty protest was Okoumou’s most visible act to date, drawing millions of eyes worldwide to the U.S.’ self-made crisis at the Southern border, she hasn’t shied away from taking brave, decisive action in the intervening months. Okoumou also climbed the Eiffel Tower, a Border Patrol Museum in San Antonio, Tex., and a migrant detention center in Austin, according to The Gothamist. The last protest was deemed a violation of Okoumou’s probation, and she has been under house arrest in Staten Island for the past two weeks as a result. “I’m still working behind closed doors, the government cannot shut me up. The confinement of walls will not stop me, and that includes prison walls,” she said before her sentencing. The activist, who was born in the Republic of the Congo and immigrated to the U.S. in 1994, showed up to court on Tuesday with clear tape over her face, “only nodding or shaking her head when reporters tried to ask her questions,” writes AM New York. Upon leaving the courthouse, the tape had been removed from her face. Okoumou flashed a smile and raised a fist to supporters outside, who cheered as she emerged from the building. She wore a white headband with the words “I care!” written in black ink and a green military jacket—an ironic nod to first lady Melania Trump—with the phrase “I really do care care” emblazoned across the back. And if Okoumou’s own statements are any indication, she’s not going anywhere. Speaking to the Gothamist, Okoumou emphasized the importance of collective and individual actions.